Simple Entry Decorating! Wow in 1 Hour! Decorating your entry is an opportunity to tell a story; focused around your life and loves. Along with the color, shape and style of your front door, your entry is the first thing visitors see; the first glance they get into your world and interpret it. So, what story is your entry saying about you? Is it full of energy, fun, style and memories or is it telling the other kind of family stories, the ones you prefer locked behind a door? 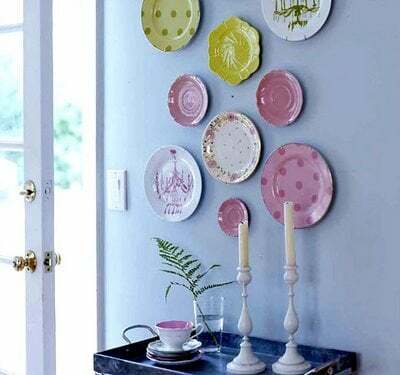 Since time and money are a luxury for anyone with a busy life, here are some entry decorating ideas that you should be able to pull off within an hour especially if you are using things you already own. This approach is great if other parts of the house are looking a little crowded or congested. So, there will be no painting, stripping, stenciling, major tools or sweat involved. Apologies to anyone who wants to pull down walls, re-carpet or strip something, this is mini make over isn't for you, but could get you over a decorating slump until you're ready. Sign up and get 42 Interior Design Secrets as a thank you. You don’t have to paint, primp and spend money to decorate your entry and change the color scheme. Rearranging items from your drawers and shelves can make them look totally different in a new spot. I find it creative and liberating because the inspiration comes from everyday objects you already own. So head out to your front door and look back inside with fresh eyes. What's your entry saying to you? If you find something ugly, tired or just dull, get rid of it. When it comes to decorating, nothing is set in stone, all rules should be broken and you are free to do only what makes you happy. After all, how you decorate your entry or hallway will depend on whether you need entry storage, your entry is small thin or you don't have an entry at all and want to create the illusion of one. Apart from the basic entry decorating ingredients listed below, take care to add contrasting colors, layer your story with color, texture, balance and create a strong focal point memories, feelings, and energy. I get into color and theme below but first lets look at the basics. The three most common entry elements used are the table, lamp and mirror trio, but you can mix them adding more or fewer items. This is the most commonly used entry story. You can see why; it works. The three elements create a focal point successfully using the elements of height, light, character, flair as well as being very practical for task lighting, a place to hold items coming in or out of your home and grabbing one last look at yourself as you head out. 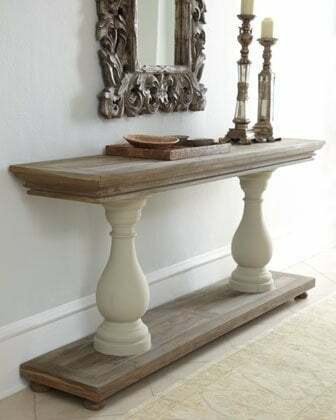 A console table, flush against the wall, is often the focal point and base ingredient for any entry and serves as a halfway house for anything come in or out of the house. Any size or shape is fine as long as it doesn't overcrowd the space or take over. Add a bowl,vase of flowers and some lamps and you are set. And if you don't have a console table, consider these alternatives; a cabinet, cupboard, bookcase, coffee table, ottoman, chair, sofa or bench. 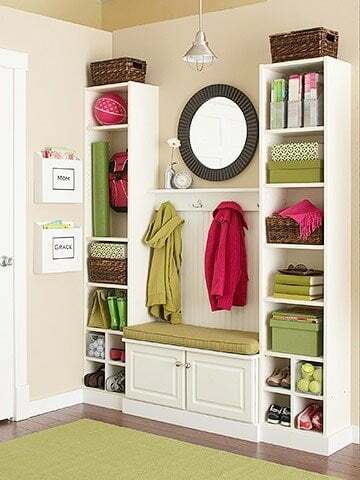 The beauty of using a cabinet, cupboard or bookcase is you are effectively adding to your storage quota. These days no-one has enough storage especially when it comes to shoes, bags, keys and umbrellas, so finding a way to de-clutter and organize really helps. If you are using an ottoman or coffee table , then item above it should be on the larger side to compensate for the reduction in height so the ottoman or coffee table doesn't look dwarfed and out-of-place. If a table is out of the question, create one out of pillars and wood or use a bench, chair or even sofa to fill the space instead. This is a great look and again, a very practical idea. If you have a wide entry hallway, why not use a round table in the center, and take the focus from the walls to the center of the entry. Adding height is almost as easy with the addition of flowers, vases, and ornaments. Personally I like a large candelabra because is also adds light and just a little drama. 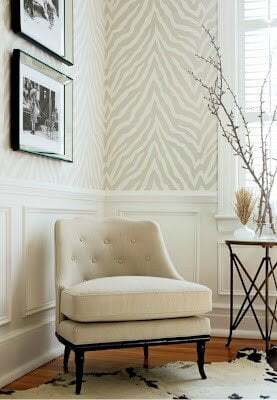 If you have the space a great addition to an entry is a chair or armchair pulled next to your console table. These can always be pulled inside if you need the additional seating. A dining chair on either side of the table also looks impressive. One armchair is normally more than enough, but you can add as many dining chairs as you want, or need, if it doesn't overcrowd the space. If you use an armchair, consider adding books and a reading lamp to create a reading nook. A single large armchair is the perfect addition to absorb space in awkward spaces such as under the stairs. If you armchair is less than perfect consider adding a slip cover or covering it with a tapestry or throw in contrasting colors. Something over your entry table is next. Mirrors are popular. Yes, you get to see what you look like on your way out but they also add reflect light which is great; day or night. 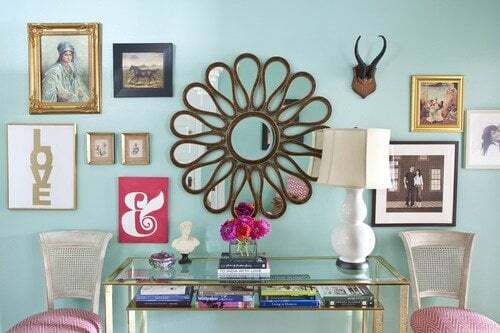 An entry mirror placed over your console table adds height, and balances your look. 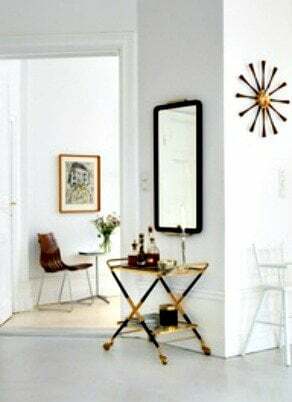 Mirror alternatives include a large painting or a collection of smaller painting, hanging plates, trays or even a group of wall sconces or candles holders. This is the time for a little drama; a portrait of an imposing ancestor (not necessarily yours), a large gilt mirror, or something completely unexpected can all work here especially if you use contrasting colors. Adding one or two lamps to your entry adds height and interest. Table lamps or standing lamps are great for task lighting. They are a softer lighting solution than bright overhead lighting and perfect mood lighting for entertaining. Are they are must? Not really. But lighting is important, so if there is no space or time to find a lamp, how about using a dimmer or changing the light shade? Bungalow Blue Interiors has a great article on how just adding a new lamp shade can change the look of your entry. Rugs define the area and space of your entry. A runner leads flows naturally into the rest of the home, square or oval rugs contain the entry, defining it as a separate area. Rugs also add color, warmth and texture and depending on the color can help to pull your look together into a cohesive story. If you're interested in how rugs affect your feng shui read this article in About.com here. Do you need a rug? Not, at all. Mostly, it depends on the condition of your entry floor. Nothing looks nicer than beautifully painted or stained floorboards, and if your carpet, floorboards or tiles look tired, a rug could be your answer to hide any imperfections. You could always paint your floorboards with a faux rug but this is a one hour makeover, so we'll leave that for another time. 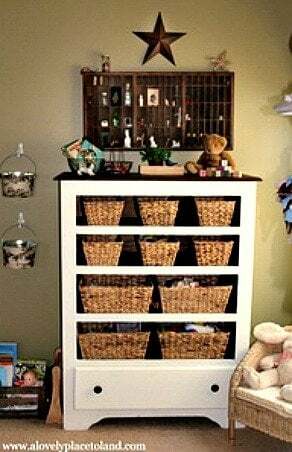 Entry storage is perfect if you have a family, or lack storage in the rest of the house. From books, shoes, bags, throws and bicycles, under your entry table or in drawers or boxes, entry storage is often neglected. So if you need some, create some! A bookcase or chest of drawers can all help to organize your life, so use it. A thin hallway entry can make entry decorating difficult. But there are always ways around it. Consider using a thin bench, a pedestal, a fireplace mantel (without the fireplace) or parts of the wall to create a focal point as you enter your home. 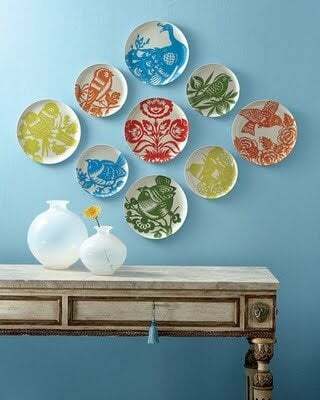 This could be the time to consider a wall stencil or decal to add color and interest without actually adding furniture. Or use some of these suggestions from Bower Power Blog such as a photo gallery to get your inspiration going. If you don't have an entry but would like to create the illusion of one, place a chair, small cupboard or cabinet and something above it on one or both sides of the front door. This works even if your front door opens on to the living room. Another idea comes from DoorSixteen. Create an entry by using a lamp, some books and a huge "&" sign to create a welcoming entry. 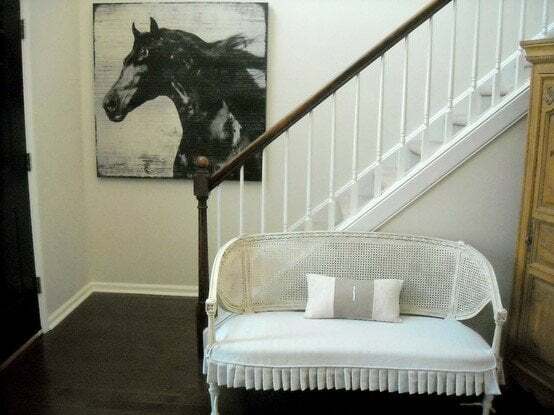 House Tweaking has created feminine entry and masculine entry looks you might want to check out. It's all about balance, preference and what you already own. Infusing these elements so they look as they belong together is the next step. How do you tie these pieces together so it looks like a deliberate decorating theme and not odds and ends you found around the house? Often its the smaller items that tie your look together. Placing related or unrelated everyday objects together as art is perfect when you tie them together with color, as detailed in this article by SF Gate here. You can group objects on a table, wall or bench. The easiest way is to layer another color into your theme. Don't add more of the same. Brighter, contrasting colors help create a focal point. This works particularly well against muted, monotone or dull themes. One contrasting color is enough. Warm wood objects on a white wall are a perfect example but the same white walls would look great with royal blue or even splashes of hot pink and green. Which means you can change your look just by changing your accent colors. Think about it next time you want a change. You don't need many three or five pieces can be enough. 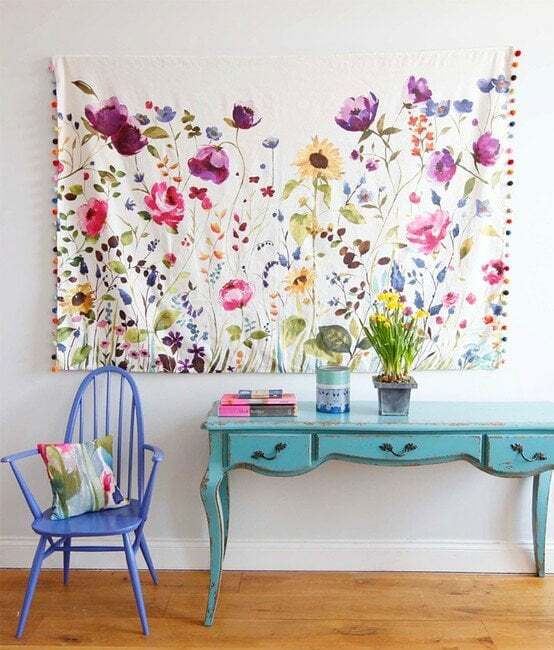 If you don't own things in matching colors and you have time, paint items the same color or frame and place in a Gallery wall like The Creativity Exchange in identical frames or hang from wire cables. Texture is also a great way to tie objects together. Pull your look together by using a throw, cushions or pillows in contrasting colors or textures. A rough-looking table, vintage chair with a gilt mirror, or an un-upholstered chair next to a glamorous lamp and silk rug can be layered with a throw or cushions. Just as you don't want a monotone color palette, balance your look with texture so it's not all rough or slick. Contrasting textures help other pieces come alive, because contrast is what your eye is not expecting and registers the most. Let's not forget height. Having everything at exactly the same height can look dull. Different heights make the eye move from piece to piece. And that's a good thing. So disrupt bland by introducing either color, texture or height - the same things that also link them together. This is a lot of information but it can all be pulled off in an hour! By rearranging and using furniture and objects from one part of your house or apartment to your entry will bring energy and change to that area and your household. Before you begin, I cannot stress how important it is that this area is clean, all wall or floor markings are repaired or covered, and the furniture is cleaned and fresh. 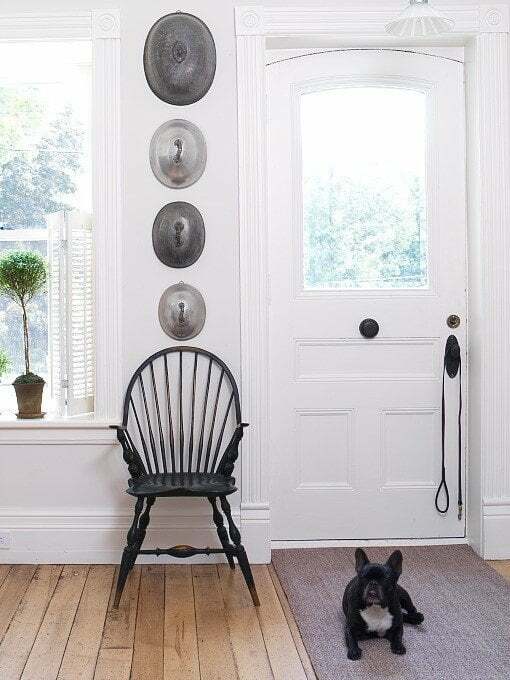 The first impression might begin with your front door but it is soon taken over by your entry. To get a book of simple decorating ideas sign up to our Newsletter and get 42 Interior Design Secrets as a thank you. 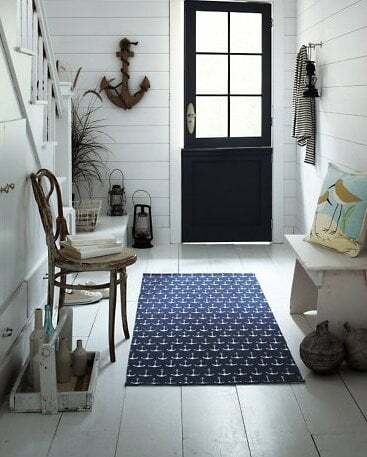 Love the picture with the wooden anchor! Now, if you need some Christmas decorating eye candy : hop onto mine! 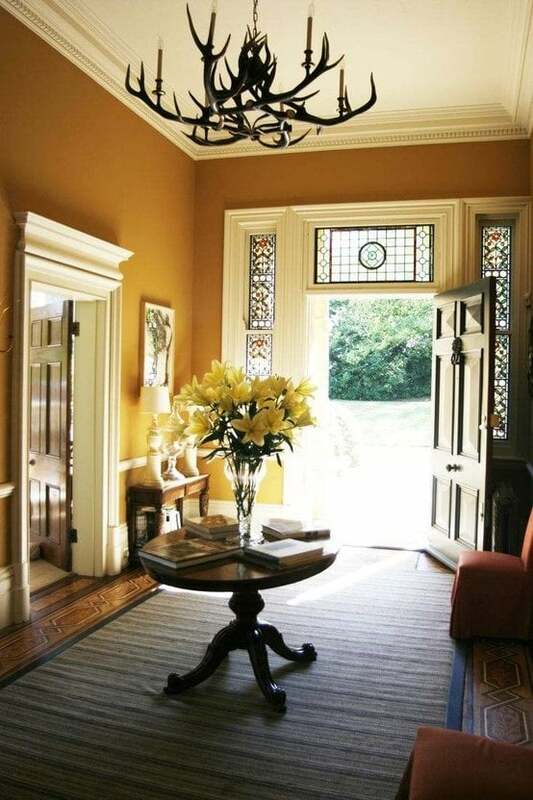 On you piece re: entryway ideascan you tell me where I might find that rustic round mirror that is shown with the console tale and vase of yellow forsythia branches? I'm doing my best to find the details for you but it was from a private home - so not sure if I can find out. I'll let you know. Great information,thank you. I especially like the thin entry! Let me know if there is anything you would like me to write about and I'll do my best to cover it.